Really enjoyed this book, made me laugh and made me cry. Cant wait for the next one. 5.0 out of 5 starsFabulous book! I'm in love with this series! Just received this book today and I couldn't put it down. I can't wait until the next book comes out! By far the best series I’ve read this year. What an amazing ride. 5.0 out of 5 starsThis really is in a league all of its own. Well, naturally, this book picks up where Book 1 ended with a cliffhanger, folks. Again, since this is not an ARC, I simply don’t have the time, thanks to a full literary dance card of ARCs requiring my attention, to dissect and really analysis this second on-going sequel of the Masks of Under series. Just know this one unfolded at a much slower pace, with the heroine getting to know up close and personal the one king everyone else seemed to completely misunderstand. Not that he was as harmless or innocent as a sweet cuddly puppy, people. No, this guy had a dark alpha male side to him, that’s for certain. I was just pleased as punch we were shown a side that gave this creature a heart that was motivated by remorse and redemption. Ultimately, too, a heart that beat with love for this leading lady. I'm going to start out saying that King of Shadows is the second book in The Masks of Under series, so YOU MUST READ King of Flames (Book 1) FIRST since it's a continuation. If you don't, you will be super confused. 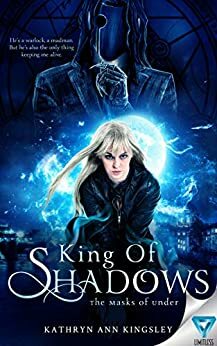 King of Shadows picks right back up where Book 1 left off, where Aon is rescuing Lydia, or he is really? See, he's a complicated hero, if that's what we want to call him, and I'm not saying crap one way or another because I don't want to give anything away, but he definitely gives the name tortured soul new meaning. They have serious chemistry, but they don't act on it quickly, because again, is he really a hero in this story? Or a villain?! I will say that he's wickedly yummy on one hand, while on the other.....well never mind, you'll have to make up your own mind. There's a cast of secondaries that I can't decide what category they fall into, the good, the bad, or the oh so ugly, which means that I have a million questions still which are making me crazy. Now, this is where my insanity comes in at, the ending. Yep, that ending was so much worse than the first cliffy, and now I'm afraid that Kathryn Ann Kingsley is becoming a love/hate relationship for me since she clearly wants to KILL ME DEAD! Like seriously, WHY OH WHY?! I'm dying inside now, because I have an inkling of what's ahead, but not how it's going to go down if that makes sense?! Anyway, I NEED MORE, and you do too, so check out this oh so addictive serious that I HIGHLY HIGHLY HIGHLY RECOMMEND TO ALL!